If you’ve never tasted homemade tortillas, you’re in for a real treat. These are perfect to serve warm with butter or as an accompaniment to soup. In a medium bowl, combine the flours, baking powder, and salt. Cut in the shortening until thoroughly combined. Gradually add the water and toss together until the dough can be gathered into a ball. Knead the dough for several minutes. Divide the dough into 12 balls. Cover with a tea towel and let rest in a warm place for 15 minutes. On a lightly floured surface, roll each ball into a 10-inch circle. Cook the tortillas one at a time in an ungreased medium-hot skillet until browned on one side. turn and cook the second side about 1 minute or until the edges have started to curl. 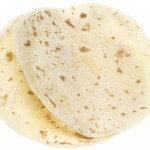 Wrap the warm tortillas in foil until all 12 have been cooked.